This obsession of smartphone manufacturers with the notch needs to end but looks like we are going to see a lot of phones with notch design this year. The Zenfone 5 series that was announced at MWC features a notch design, and the company talked proudly about this design by even comparing it with the iPhone X’s design. Some Chinese companies like Doogee, Oukitel, Leagoo, etc. are already in this new trend and some popular companies like Huawei, LG, etc. are also coming soon with their phones having a notch on top. 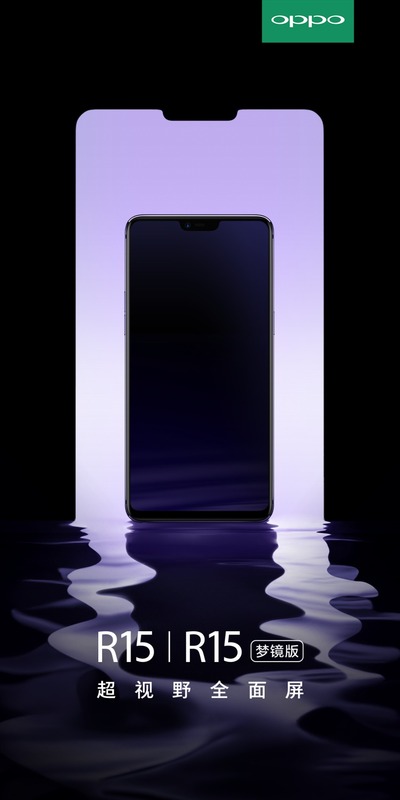 Oppo is all set to launch the Oppo R15 and R15 Plus smartphones, and today, the official teaser confirmed that these two are coming with a notch. Just like the Zenfone 5, the Oppo R15 and R15 Plus have an edge-tedge display with a notch on top that houses the earpiece, front camera, and the sensors. And yes, there is no depth sensor, flood illuminator or dot projector embedded within this notch like the iPhone X. The bottom bezel is thicker than the one on iPhone X, again, for unknown reasons. Same is the case with the Zenfone 5 that has the same thicker bottom bezel as compared to other three sides. We don’t know the specifications yet, but there are rumors that the phones are coming with a Snapdragon 670 processor. Well, let’s see what Oppo has to offer with its upcoming iPhone X lookalike.